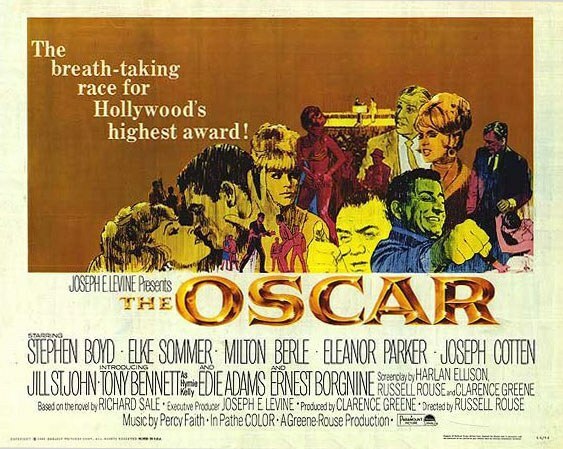 This week's offender is an anomaly in that it's overflowing with Oscar-winning talent and yet somehow manages to be insanely horrible; 1966's "The Oscar." With the combined talents of Tony Bennett, Elke Sommer, Eleanor Parker, Joseph Cotten, Ernest Borgnine, Edie Adams (see? this list keeps going and going), Milton Berle, and Jill St. John, it's almost unbelievable that a film of this stature could be bad. The story, told in flashbacks on the night of The Oscars, details the brutal rise of actor Frankie Fane, beginning as the sleazy opening act for his slightly-less-sleazy stripper girlfriend to Academy Award-nominated actor. It is a bold if wildly misguided attempt at an exposé of the seamier side of Hollywood, something seemingly dreamed up by Jackie Sussann (what was it about 1966 and these flashy tell-alls? ), and, at the risk of editorializing, I have a hard time believing that no single person involved in the making of this movie realized that the theatrical efforts of the cast could do little more than lend some polish to a movie destined for ridicule. One can only imagine what the casting director had to do to commit so many talented individuals to a script that reads at best like a romance novel bought in the checkout line and at worst like the half-finished manuscript of a bored housewife. Whereas some movies that revel in being intentionally tawdry can be sincerely riveting, the repulsion the viewer inevitably feels for the character of Fane and the atrocious dialogue (no, you don't understand, it's mystifying - "I've let you castrate me inch by inch" comes immediately to mind) strip the wheels off this drama and make it an all-star comedy. I stopped the movie a third of the way through to make sure I wasn't watching a parody. Not one star in the bunch betrays the seriousness the movie believes it commands, making this the most flawless example of camp I've ever watched. Final Verdict: This hollow attempt to illuminate the corrupt wheelings-and-dealings of the West Coast gliterati is burdened by an excess of 60s slang (the "dig this heavy scene" kind), contrived, circuitous dialogue that Jackie Collins herself (may she rest in peace) wouldn't own up to, and a loathsome, lecherous lead. This insiders' attack on Hollywood is cinematic treason in its showiest form and it is one of the greatest movies I've ever seen. My meager vocabulary can in no way encapsulate exactly how entertaining this tasteless spectacle is. Redemption approved.